Oxbow Alum is Head Counselor! Haley English, Head Counselor, is currently living and creating art in Albuquerque, New Mexico. Haley is attending the Institute of American Indian Art with a focus in painting. She is Red Lake and Turtle Mountain Chippewa and comes from a multidimensional family that inspires much of her artwork and personality. She has been an elementary school art teacher, nanny, and art camp counselor for the last five years and hopes to continue working with kids and art for many years to come! Haley is an Oxbow alumna from OS18 and is really excited to be returning to Oxbow art camp for her second summer! Camp Welcomes a New Counselor! MaryKatherine Michiels-Kibler, Counselor, or simply MK, is a San Francisco native who frequently finds herself in Jackson Hole, Wyoming. She recently returned home from living in Florence, Italy for nine months where she studied history and photography and saw more art than she thought was physically possible in a year. In the fall, she will return to Sarah Lawrence College in New York where she studies writing and film. MK loves working with youth of all ages, especially if it involves creativity and nature. An Oxbow Summer Camp alumna, she is excited to return and hopes to learn and grow as much as a counselor as she did as a camper. Oxbow Alum is New Camp Teaching Assistant! Mikhaila Quezada-Freda, Teaching Assistant, attends The Cooper Union School of Art in New York City. She grew up near some mountains in Los Angeles, where she spent most of her time walking dogs, riding bikes, and hiking. In New York, the lack of mountains and the cold weather haven't discouraged her from being outside: even in winter, she commutes on her bike and works at a farmer's market. She works primarily in sculpture and installation, which entails casting with strange materials and using home-improvement techniques. Her apartment is part of her practice, as she uses piles of recyclables as furniture, and makes drawings out of cleaning products on her bathroom wall. She is an Oxbow alumna from OS27, and can’t wait to be back in Napa this summer. This is your summer to be surrounded by artists, play with familiar and new materials, and develop your art skills! Spend a couple of weeks with us along the river, meeting new friends, getting inspired, and making art! Registration can be found under the "Summer Camp" tab on the school website at www.oxbowschool.org. Register now - space is limited! Give INSPIRATION. Give a FRESH PERSPECTIVE. Give CREATIVITY. Give the gift of CAMP! "The Oxbow Community is supportive, caring, inspiring, passionate, inclusive, driving, and constructive...I've definitely grown in my self-confidence and willingness to step out of my comfort zone." "I have had my eyes opened to all these different forms of art that I wasn't really aware of and I've made so many friends." "It is definitely one of the most unique and accepting groups I have ever been a part of in my life and it was a privilege to encounter such a diverse group as I have here. I have grown to accept and admire many things about myself." Reserve your spot for Oxbow Summer Art Camp! The time for flip flops, t-shirts, and summer fun has arrived! The 1st session of 2015 OSAC has just begun, kicking off our 12th year of Oxbow Summer Art Camp. For the next 2 weeks, we will dive deep into our creativity and be immersed in art practice both in and outside the studios. We invite you to come check out this session's creations at our Final Show on July 12th from 3:30-5:00pm. Additional camp details can be found under the Summer Camp tab on the school website at www.oxbowschool.org where you can also read all about our amazing summer staff. Follow us on the summer camp facebook and twitter! native California campers at Oxbow this summer. 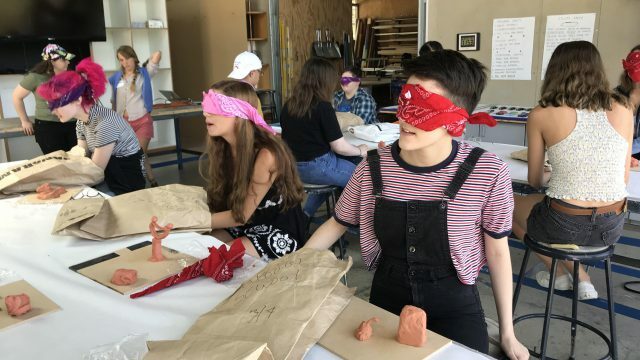 In our Fundamentals classes, campers explored a dynamic range of themes and techniques such as Cute vs Creepy, Elevating the Mundane, Animal Identities, Blind Fold Tour Mapping, and completed a Cardboard Shoe Challenge! Along with our campfire rituals, our Co-Curricular Program featured a Summer Art Olympics, Surrealist Night, Alter Ego Fashion Show, and Inspiration Nights. Campers also developed new skills in our afternoon arts workshop series, participating in Indian Fold Dancing, Boxing, Yoga, Bookbinding, And Cyanotypes (just to name a few)! 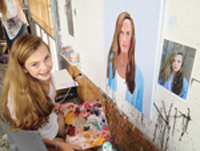 During the 2nd half of camp, students devoted their studio time to Final Projects. Honing in on personally relevant subject matter and taking risks, campers' projects were remarkably thought provoking. These can be viewed on our Facebook page (along with images of day-to-day camp life). Registration for our 2015 program will open in mid-October. 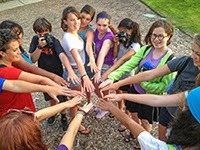 Additional program information can be found under the Summer Camp tab on the school website at www.oxbowschool.org. Please contact summercamp@oxbowschool.org or call 707.592.6295 with inquiries. I look forward to next summer! Our 2013 summer camp marked the 10th year of our summer camp program! This year's summer campers included California natives living and creating alongside others from St. Louis, Beijing, Bali, Seoul, Memphis, Mazatlan, and Santo Domingo! Both sessions, campers immersed themselves into their artistic practice in the studios and played hard in our co-curricular activities. Among our counselor team we had three semester alumni and a former semester teaching assistant. Also noteworthy, is the exceptional dedication of our summer faculty members, one returning to camp for her 7th summer and another for his 8th! To see the program photos check out our Facebook and Tumblr pages. The planning for our 2014 summer camp program has begun! More details will be on our website shortly. Additional program information and photos can be found under the Summer Camp tab on the school website at www.oxbowschool.org. Please contact summercamp@oxbowschool.org or call 707.592.6295 with inquiries. Calling all young artists out there! Oxbow Summer Art Camp is just a few short months away! This 10th anniversary year promises to be another inspiring summer full of art. Come live along the river, meet new friends, hang out by the campfire, eat delicious food, dance your heart out, and dive deep into your creativity! Our art-immersion program for teens encourages the exploration of each student’s creativity and vision. Teaching artists will provide instruction in drawing, painting, sculpture, printmaking, video, and photography. Students will then have the opportunity create a personal project of their own design. No prior experience or portfolio required - just a desire to jump in, try new things, and see what happens! Additional camp details and registration can be found under the “Summer Camp” tab on the school website at www.oxbowschool.org. Help us get the word out by "liking” us Oxbow Summer Art Camp on Facebook! See you at the “Oxbubble” this summer!